I don’t think it’s arguable to say that Disney/Marvel’s superhero movies do better than Warner/DC’s. Marvel has the third biggest US movie of all time (based on box office) in The Avengers, and while DC’s Dark Knight trilogy also ranks highly on that list, they haven’t been able to make Superman an unqualified success or build a universe the way Marvel has with related films, each with multiple entries in their series (Iron Man, Thor, Captain America). Yet this year, DC is having a great track record placing surprising properties as potential TV shows. 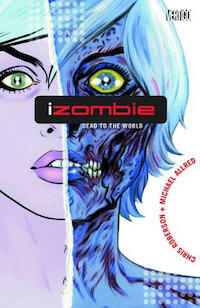 The latest announcement, according to Deadline.com, is iZombie, based on the Vertigo comic series by Chris Roberson and Michael Allred that ran from 2010-2012. In the comic, Gwen was a zombie gravedigger who needed to eat a brain every so often to keep from losing her personality and memory. When she did so, she gained awareness of the dead person whose brain she consumed. In the proposed CW (of course) series, Gwen will be a medical student working in the coroner’s office. The project, to be written by Rob Thomas and Diane Ruggiero (Veronica Mars), is described as a “supernatural crime procedural”. She’ll eat brains and solve homicide cases, in what sounds like a younger twist on Pushing Daisies. It remains to be seen whether some of the weirder comic characters — including a ghost, a “were-terrier”, and various vampires and conspiracy group members — will make it to screen. As Deadline points out, “Warner Bros TV has been very aggressive developing and selling DC-themed series this season, including the Arrow spinoff The Flash, iZombie and Hourman at the CW, Gotham at Fox with Bruno Heller, and Constantine at NBC with Daniel Cerone and David S. Goyer.” Marvel, by contrast, has the now-struggling Agents of S.H.I.E.L.D., which debuted strongly but is having trouble keeping audience interest. With their Vertigo imprint, DC has a wider variety of character types, beyond just superheroes, to pitch, and those varied types seem to play better on the smaller screen.